Why Is It Dangerous To Wake Up A Sleepwalker? s with sleepwalking, I know all too well the mystery and surprise I give myself when I wake up in the middle of a sleepwalk. Each time, I breathe a heavy sigh of relief that I didn’t encounter any danger and that I woke myself up. You may be wondering, why is it dangerous to wake up a sleepwalker? Trust me, it can be scarier than you think. What Does it Mean When You Sleepwalk? According to the Sleep Foundation, sleepwalking – formally known as somnambulism, is a deep sleep behaviour disorder that results in walking or performing other complex tasks while you are asleep. Sleepwalking is much more common in children than adults and typically occurs when the person is deprived of sleep. Since sleepwalking occurs during deep sleep, it can be difficult to wake the person and they will most likely not remember the behaviour. In What Stage Does Sleepwalking Occur? Sleep walking occurs during deep sleep, often during stage three or stage four of the normal sleep cycle. According to Psychology Today, sleepwalking will most often occur during the non-REM sleep of stages three or four early in the night. Although, sleepwalking can still happen during REM sleep near the morning. 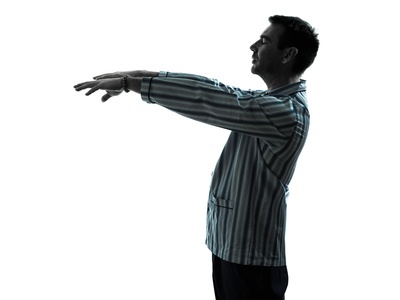 When sleepwalking during the deeper stages of sleep waking up a sleepwalker can be more difficult. What Happens If You Wake Up A Sleepwalker? According to Mental Floss, sleep experts state that forcefully waking up a person from a very deep sleep when they are in the impaired state of sleepwalking, can cause the person to become startled, agitated, or confused. Many times, when trying to wake up a sleepwalker, and when the person first awakens, they will not recognize the person trying to wake them up. This can cause them to push you, lash out at you, or even strike you in their alarmed state. Even if the sleepwalker does not become aggressive when first awoken by a friend or family member, they can still become quite groggy. In a groggy state, they may try to go about day to day activities. These activities could range from cooking, attempting to get dressed, or even trying to get behind the wheel of their car. While often times a sleepwalking episode is less than 30 minutes, they can be dangerous to the sleepwalker. Although most of the time sleepwalking will include complex activities such as getting up and walking around or other normal tasks, there is a high risk of injury to the sleepwalker during that time. Sleepwalkers can easily lose their balance or even trip over objects which end up in injury, and these injuries can be minor or even serious depending on the situation. This is especially true if the sleepwalker has a habit of trying to cook or get behind the wheel of the car during their sleepwalking state. Not only could they cause great harm to themselves, they could cause harm to others. While it might seem ideal to try to wake up the person in the middle of their sleepwalking, there is actually a better solution. If your child or a person you live with is caught in the act of sleepwalking, instead of trying to wake them up and end up scaring them or getting yourself hurt in the process, it is actually better to guide them gently back to their bed. For example, last time I was caught sleepwalking down my hallway, my partner knowingly took me gently by the arm and walked me slowly back to bed. After tucking me in and giving me quiet reassurance, he watched over me for a bit to make sure I was staying put. These methods will ensure you and the sleepwalker stay calm, quiet, and safe. It’s always a great idea to keep an eye on the sleepwalker for a few minutes once they are back in bed to make sure they are getting back into their deep sleep REM cycles just fine. Because it is normal for sleepwalkers to get out of bed more than once in the night – especially if they are having a more difficult night that particular evening. And although children seem to be the majority of sleepwalkers, it can happen to adults quite regularly too. If you are an adult who suffers from active sleepwalking on a regular basis, it is a good idea to have a roommate! So, why is it dangerous to wake up a sleepwalker? The simple, and probably the most common, answer is the fact that you or the sleepwalker could become injured. While it might seem like a good idea to jolt a person awake during their sleepwalk to prevent them from doing bizarre or even dangerous activities, stick to the easy methods of simply guiding them gently back to their bed. Best Mattress Topper For Back Pain: Finally Some Relief! Can Medical Marijuana Be Used As A Sleep Aid? What to Avoid Before Bedtime?